Patchwork quilt/cloth with strong overall design of very small squares. The colours are navy, red, cream, green (khaki) and fawn. There is a wide fringe on all sides. There is no padding. The backing is cotton sateen. The quilt was made in about 1900 to 1905 by Millist Vincent thought to have been a batman to Lord Kitchener in the Boer war. It was handed down to 1. Mrs. Millicent Driscoll daughter of Millist Vincent 2. Mrs.Dorothy Hammond grand-daughter of Millist and mother of the present owner. 3. Mrs. Dianne Corringe great grand-daughter of the maker Millist Vincent. With these 3 generations it was been in Tasmania. It is not now used.
" A wide range of cotton fabrics have been used to make this quilt in the traditional log cabin style. The strips of the log cabin are joined by rows being hand sewn onto a small square backing fabric, each square of strips has then been hand sewn together to form the quilt. The work is backed with a sateen printed fabric decorated with paisley design. A strip of the lining trims the edge of the front face of the quilt. The lining is attached with machine stitching. 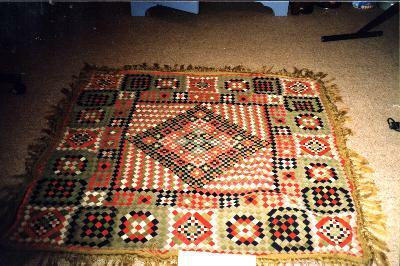 There are numerous tacking stitches that remain in the front face of the quilt. There are approx 9000 pieces in the quilt, most being only 5mm in width. The strip quilt is handsewn and quilted. Quilt top has 13 panels or strips of 3 different cotton lawn floral prints. Some fabrics are now wearing. Backing is of plain white cotton. The padding is wool. Quilting features a triple row cable design with flower motifs.